Everyday I take a morning walk with my dog Clover on the trails near our home. We pass through open fields, past ponds and wooded areas. I love to breathe-in the changing landscape and acknowledge how grateful I am to live near such beauty. Last week I noticed a dangling mobile someone had created out of bent bows. It was hung out on a limb over the pond. A lovely surprise. Today I spotted this little guy sitting in a tree. 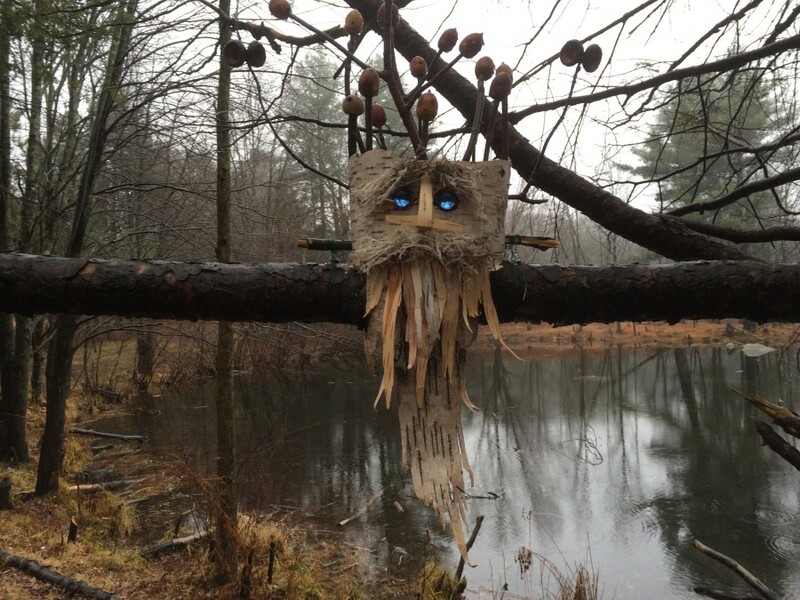 He’s made out of birch bark, acorns and two blue stones. I love him! I have no idea who the artist is, but I hope he or she continues to surprise me with what feels like little gifts or nods to nature. I know that when I’m paying attention, the treasures appear. I hope this season also brings you small pleasures to open your heart.